– Mongolia is a vast, landlocked country, between Russia and China. – Its continental climate is one of the world’s most extreme: extremely cold winters, hot summers, high winds… but mostly blue skies! – Almost a third of Mongolians are still nomads who herd sheep, horses, yaks, camels, goats. There are about 10 horses for every person in Mongolia. – 800 years ago, the Mongolian emperor Genghis Khan, followed by his sons and grandsons, put together the largest empire ever, including most parts of Asia and some parts of Eastern Europe. – Mongolians are mostly Buddhists. A smaller group, the ethnic Kazakhs in the west, is Muslim. – Although life in the countryside seems to have remained unchanged for centuries, Mongolians are well educated. Their literacy rate is up to 98% — more than in most occidental countries! – Because of harsh conditions, Mongolians have to rely on each other in rural areas. This has contributed to the development of an extremely hospitable culture. – Everyone is always welcome in a yurt. To knock on the door would even be considered impolite! The custom is to call out “Tie up the dogs!” as you approach. – One enters the yurt with the right foot. It would bring bad luck to hit or walk on the door frame, since there’s a protective spirit living in it. – One walks clockwise in the yurt. – The door usually faces south. – Men are traditionally seated to the west, women to the east and special guests to the north. The north-facing wall of the yurt (opposite the door) is the most sacred area. – For Mongolians, the yurt symbolizes the universe. They believe the axis of the world runs down through the toono (central dome) to the centre of the earth. – The toono represents the interface between humans and the cosmos, being a passage to the divine world. The bagaanas (central posts) also connect human and divine, earth and sky. – Although the wooden parts of the yurt’s structure are often painted orange, the outside of the yurt is usually white, representing purity, good luck and nobility. – Women light and care for the fire; they remain silent while doing it. – Things are always given to someone with the right hand, with the left hand supporting the right arm, or with both hands. – The yurt is not anchored to the ground, in order not to harm the earth. – In strong winds, the rope that hangs from the centre of the toono (central dome) is tied to a large rock to anchor the yurt. When not in use, this rope is wound in a serpentine fashion and stored behind the roof rafters (huns) to the north of the yurt, as a symbol of fertility above the parents’ bed. 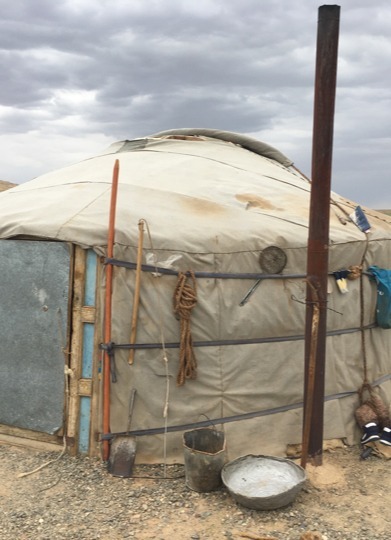 – 5-wall yurts are the most common in Mongolia, and house families of 4 to 8 people. They all have 81 huns (roof rafters). 81 is 9×9, nine being a sacred number for Mongolians. – There are many more interesting things to say about Mongolia and its people. You might want to visit this fascinating country!